“Witnessing and Wounding in Suzan-Lori Parks’s Venus.” Multi-Ethnic Literature of the US (MELUS) – Special Issue: Visual Culture and Race. 39.2 (2014): 188-207. 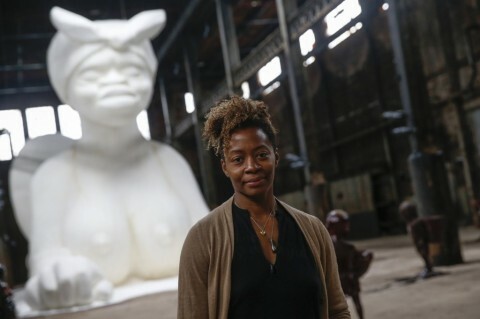 In this essay I argue that in her play Venus, Suzan-Lori Parks complicates the notion of the gaze to shift power away from the manifold viewers witnessing Baartman’s display (both the contemporary audience and the audience built into the play), and this creates a space for Baartman to exist without the burden of having to be representative. In the play, Baartman articulates her experience and gives voice to the pain underscoring it. In essence, Parks constructs an audience that is prepared to see Baartman as a black woman rather than as the black woman. “Navel-erasing: Androgyny and Self-Making in Toni Morrison’s Song of Solomon and Jamaica Kincaid’s The Autobiography of My Mother.” Imagining the Black Female Body: Reconciling Image in Print and Visual Culture. Ed. Carol Henderson. New York: Palgrave MacMillan, 2010. 145-161. This piece makes the case that Toni Morrison’s Song of Solomon and Jamaica Kincaid’s The Autobiography of My Mother inspire a rethinking of what it means to write (or write about) the black female body. By creating figures who elude definition and categorization, both writers imagine black womanhood in a way that places notions of black female bodies and identity outside of generally accepted ideology of race and gender. This creates a sense of boundarylessness that allows for various movements, particularly between male and female, self and other, even life and death. “Holler if Ya Hear Me – Book by Todd Kriedler, Lyrics by TuPac Shakur. Directed by Kenny Leon. Palace Theatre, Broadway. New York City (Review) 21 June 2014.” Theatre Journal. Volume 61.1 (2015):124-127. “Stick Fly by Lydia R. Diamond.” Directed by Kenny Leon. Cort Theatre, New York City. (Review) 7 December 2011.” Theatre Journal. Volume 64.3 (2012): 441-444. “Violence, Visual Culture and the Black Male Body by Cassandra Jackson.” Callaloo. 36.1 (2013): 207-210. “Rev. of Reading Africa into American Literature by Keith Cartwright.” The Southern Quarterly: A Journal of Arts in the South 41. 1 (2002): 129-131. My work in the classroom and outside of that space attends most centrally to the act of contemplating the consequences of language. Toni Morrison’s notion of “word-work” informs my practice. In her Nobel Prize acceptance speech, Morrison relays an anecdote of a blind, wise woman who indirectly instructs a group of children on the promises and dangers of language. “Word-work is sublime, she [the blind woman] thinks, because it is generative; it makes meaning that secures our difference, our human difference – the way in which we are like no other life. We die. That may be the meaning of life. But we do language. That may be the measure of our life.” I quote this passage at length because it holds great meaning for me as a scholar and a teacher. The notion of word-work and its consequences underlies my work across contexts – in the acts of teaching writing, of analyzing literature, of composing and engaging in the knowledge production process. A foundational way that I infuse word work is in the classroom climate I create. I open semesters with my students by giving them the floor, allowing them to share with the class their cultural and geographical backgrounds as well as prior experience that might help them succeed in the course. With this exercise, I desire to empower students to see themselves as authorities with unique experiences that will enrich our course. It also allows me to decenter the classroom and create a space where students feel they are contributing to the knowledge-making process vs. being consumers. As a way to facilitate this, I use conversation circles in my classroom design. Doing this work up front helps us to navigate often-contentious subjects around issues of race, gender and sexuality that infuse the body of work about which I write and teach. Thus it is important from the outset to give students tools (of critical thinking, engaged listening, and focused responding) to participate effectively in the intellectual community I aim to create. Likewise, my assignments show students that they are producers of knowledge, reinforcing the notion that their contributions matter for the study of literature. In my Introduction to Literature Course on American Literature and the Body, my undergraduates produce final projects that analyze in depth an issue related to the body raised in one of the literary texts we discussed during the semester (whether it be an issue related to disability, race, sexuality, consumerism, etc.). The students must then offer a critical reading of that issue and how the text represents it. They must then draw larger conclusions about the relevance of their selected issue to the world beyond the classroom. Students often consult with news stories, other classes, and personal experiences in their discussions of the larger cultural resonance. This educates them in understanding the consequences of the literature we read and why it matters. I apply a similar strategy, but with greater rigor, in my graduate instruction. For instance, in my American Stagings: Culture, Theatre, Performance course, students produced work that examined the body of criticism about a drama that we had read, identified gaps in the scholarly conversation on this work, and argued for why the gap needed to be filled as well as explained how they intended to fill it. These kinds of exercises move graduate students from surface analyses to considering how they might enter conversations in which they have a professional and intellectual investment. As an additional means to educate my students on the relevance of the work we do in the classroom, I incorporate units designed to engage the students with the community and expand their conceptions of where learning takes place. I incorporate some form of experiential learning into each of my courses. Whether it be a guided museum tour, a guest lecture from an artist or performer in the community, a visit to a play and talkback with the actors, or a campus event that relates to our course, I encourage students to absorb the knowledge available to them within their communities. I also ask them to consider how the work we study can impact their communities in terms of how it might bring light to a subject that needs amplification or how an artist might be challenging the community to think beyond the boundaries of their comfort. It is my goal to show students the multiple manifestations of word-work in their lives – how it can be used to silence and disempower as well as how it can be used to elevate those oppressed within its constructs. I also want students to understand the lesson that the blind woman imparts to the children in Morrison’s narrative – that they hold in their hands the power to determine just how they use their voices.